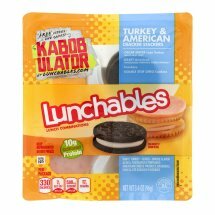 Lunchables Cracker Stackers Turkey & American. Oscar Mayer lean turkey white meat only - cured - smoke flavor added. Kraft American pasteurized prepared cheese product. Double stuf oreo cookies - chocolate sandwich cookies. Good source of protein: 10g Protein. Inspected for wholesomeness by U.S. Department of Agriculture. 7g Sat fat, 35% DV.